A violent attack on a popular actor...has many southwest Floridians talking about hate crimes. Police say he was attacked and had a rope tied around his neck and had an unknown chemical poured on him and he was beaten so badly he was hospitalized. That happened to Jussie Smollet one of the stars of Fox's hit show empire. He is openly gay and has taken clear political and racial stances. The FBI says hate itself is not a crime, but acts against a person or property motivated in whole or in part by an offender’s bias against a race, religion, disability, sexual orientation, ethnicity, gender or gender identity” are considered hate crimes. According to the FBI's most recent report, hate crimes across the country are up 17 percent, with race leading in motives, followed by religion and sexual orientation. The latest report from the state attorney’s office shows an increase in Southwest Florida 6 were reported in Lee county in 2016. 14 in 2017. 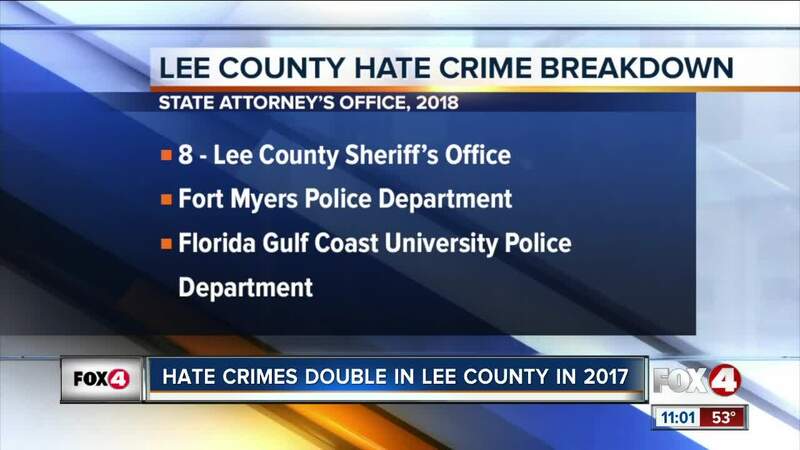 Eight for the lee county sheriff’s office, five for the Fort Myers police department and from the Florida Gulf Coast University police department. Situations like what happened to Jessie Smollet get us talking about hard topics and Arlene says discrimination and hate crimes are problems of the entire community. But that it shouldn’t stop anyone from being who they are. Arlene says that she does not see Southwest Florida as an unsafe place for people of the LGBTQ community to live and says that the community is in fact growing.